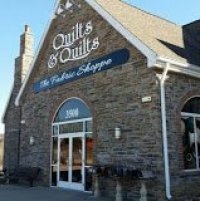 A bus tour wouldn't be complete without a stop at a quilt or stitchery shop! 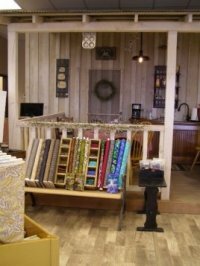 Quilts & Quilts has been in business since 1983. There are 4 generations working in the store today. The 4th generation is only 6 years old, but they thought they would start her early! 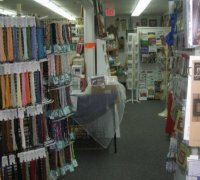 This store boasts 15,000 bolts of fabric, 200 patterns and many books, notions, pre-stamped items and gift items. You won't be disappointed. For the men, there is a Coleman outlet store, leather store and a craft store within walking distance. The Quilted Cow is located in West Branson. They first started as a clubhouse. After observing the trend of quilters traveling the area's backroads, they started offering more fabrics and notions to their travelers. There are 3 delightful owners and they are looking forward to meeting all of you! They pride themselves on being one of the friendliest shops in town. We agree! Cecilia's Sampler has a wonderful assortment of counted cross stitch, needlework and knitting supplies. There is sooooooooooo much to choose from! We always stop here on our trips to Branson. If you are looking for a project, this is the place! They have an abundance of patterns, cloth and floss. We know you will really enjoy this store!